Pleated front vs Flat front – which should I wear? Should I wear flat-fronted pants or pleated pants? It’s a question that many men consider when they’re buying a bespoke suit or simply want some smart tailored trousers for business or a special occasion: should I choose flat-fronted pants or pleated pants? To help you make that decision, HKT has put together this quick guide. We hope it gives you a better understanding of the differences between flat-fronted and pleated trousers and which style may best suit you. However, if you still have questions after reading our guide, please get in touch with us on 770-458-8682 or team@hktclothiers.com to book a consultation with one of our style consultants. We can then talk through all your options in-store and have a look at what style and fabrics will work best for you and your physique and when you intend to wear your custom made pants. It’s true to say that because pleated pants are a good practical choice for a pair of trousers, they haven’t really disappeared off the fashion radar at any point in the past 60 years. Although they have had moments of particular popularity. For example, in the 1970s and 80s, looser fashions we’re all the rage, and you couldn’t turn on your TV or go to the cinema without seeing some pleated trousers sashaying or running across the screen: think Don Johnson in Miami Vice or Richard Gere in… well, all of his films from this era. Today, pleated trousers are making a particularly strong comeback on catwalks around the world, with big hitters like Ralph Lauren and Hermes pushing this look pretty hard. But this time the new pleated pants have a much subtler, slimmer fit than the unflattering waist-spreaders often seen in the past. This renaissance comes after some serious dominance from flat-fronted pants since the 1990s. And over the past decade or so, tailored flat-fronted trousers have definitely been the pants of choice for any discerning fashionista who works in an office. A big reason for that is the recent popularity of mid-century fashion for men: this time think Mad Men’s Don Draper quaffing a whiskey cocktail in one of his sharp-fitting suits. Simply, the pleats in pleated trousers are creases on the front of the pants. This is where the material used to create the trousers has been folded and sewn before it’s been attached to the waistband. Often there are two pleats on either side of the front of the trousers. Although a single pleat is particularly popular at the moment; and if you really want to stand out from the crowd, you might consider having three pleats on either side. Typically, pleated trousers are worn on the waist, just above the hip bone. In contrast, flat-fronted pants are worn a bit lower, on the hips. They also have a contouring feature called a dart (tucks coming to a point), which is sewn into the fabric to take ease and provide shape. Ultimately, this is what allows the fabric of the trousers to lie flat against the body. Who should choose tailored flat-fronted pants? Flat-front trousers deliver a silhouette that is smooth and straight, which accentuates slimmer figures. This makes them particularly suitable for tall and slim men. This style of pants also presents a sharper, more modern look than pleated trousers, which may suit a younger man who wants a made-to-measure suit that looks classic and well-defined. Another big benefit of flat-fronted trousers is that they look great with or without a jacket. You can easily pair them with a casual shirt, polo shirt or T-shirt. Most importantly of all, it really does pay to have your flat-fronted trousers made to order. A good fit is everything, and especially with a style like this, which has a fairly unforgiving cut. 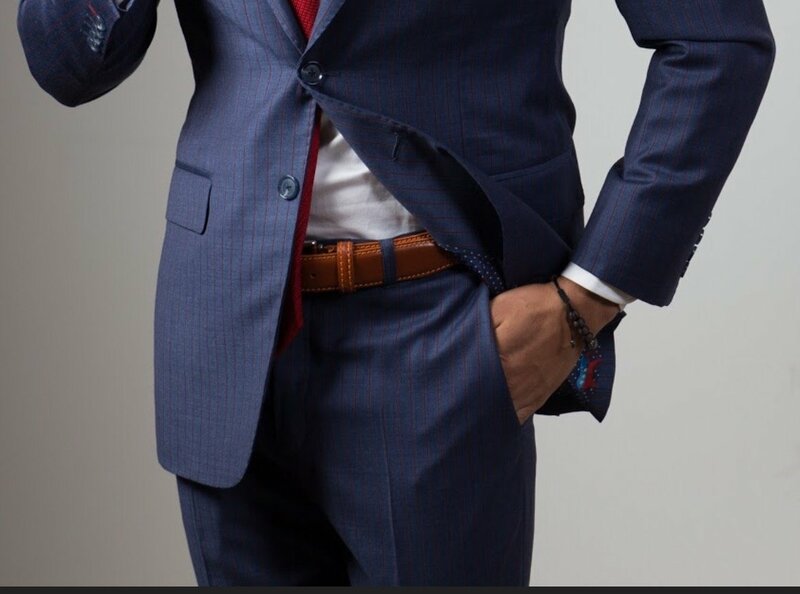 It’s also worth mentioning that flat-fronted trousers usually don’t have cuffs at the bottom of them, because there’s no need to have extra weight to improve the way they fall. However, with some types of custom made suits, such as a handmade trousers, cuffs on the pants can be the perfect finishing touch. Who should choose tailored pleated pants? Pleated pants are more generous around the middle than flat-fronted trousers, which means they are particularly suitable for larger men, or anyone who wants a relaxed, comfortable fit. If you try on a pair of pleated pants after a flat-front pair, you’ll definitely notice that that they feel much roomier as you walk around and offer greater freedom of movement. This could be exactly what you’re looking for if your job involves you moving about a lot or often travel. Previously, pleated pants have been something for slimmer men to avoid, because the extra room they provide can create a bunched up silhouette that looks sloppy. However, as we mentioned before, fashion has moved on, and pleated trousers today can be cut to offer a slimmer, subtle look for slender men. In addition, pleated trousers are flexible too. They relax any look that features a jacket and make a T-shirt with sneakers combo look super stylish (although remember to wear a good quality leather belt too). As for cuffs, you should usually expect to see them on a pair of custom made pleated trousers. That’s because the cuffs add extra weight on the legs, which helps the pants fall more naturally and prevents them bunching up on the waist. But do I have to choose between flat-fronted and pleated pants? There you have it: HKT’s lowdown on made-to-order flat fronted pants and pleated pants. “But do I really have to make a choice between them?” we hear you say. Well, to be honest, you don’t. We often create bespoke suits for our customers that feature a pair of handmade pleated trousers and a pair of custom flat-fronted trousers. Being able to choose either style really does give you far more flexibility when dressing for different occasions but just ask our CEO, Neil Balani, he gets one flat font and one pleated front pants for every suit jacket. When you meet him ask him why he orders 2 pair of pants with his suit jacket. So if you would like a stunning tailored suit made for a wedding, other special occasion or simply your normal working day, do think about doubling up on the trousers front. And, of course, if you want to chat through all the options available to you, in terms of fabrics, number of pleats and detailing, please arrange a meeting with one of our stylists consultants by contacting HKT on 770-458-8682 or team@hktclothiers.com. We’d love to hear from you.